A note came in to Camp Cocker Rescue last evening from a past adopter. So sad and beautiful all at the same time. Kelly Johnson By far the saddest thing I have read in awhile. RIP Einstein - you were not only famous but well-loved. This is bringing tears to my eyes. Rip Einstein I know George and Amal loved you. This is just so sweet and sad can't stop the tears. 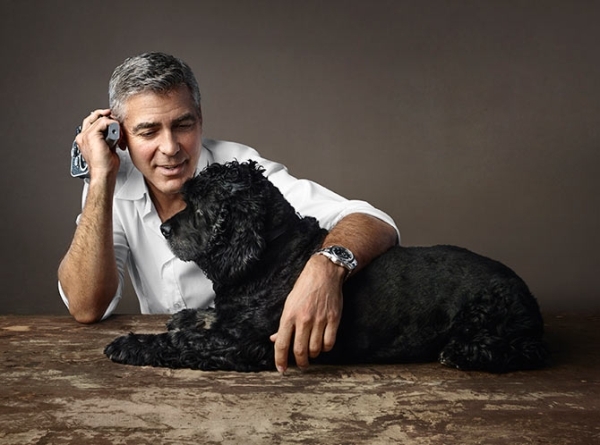 But for a dog friend he had an incredible life with George and Amal. George wrote a beautiful letter. I'm crying too. He was a very loved doggy. Bless his heart. George will always have such fond memories of his pal Einstein. i'm so sad, I know what it means to loose a dog friend :-( it leaves you with a big hole in the heart but it will be always part of your life. So sad. In that THR interview happened in around end of July the reporter wrote Einstein was still there padding around them. Since Einstein was previously in Lake Como and George was currently at Kentucky, guess he didn't say goodbye to him in person. "It's with great sadness that I have to tell you about the passing of our beloved Einstein. He hadn't been well for awhile now but this morning his valiant fight came to an end. He was a giant of a dog. He made the world brighter and his absence leaves a hole in the hearts of those who knew him. Although he wasn't a particularly great writer based on the fact he had no opposable thumbs, he left a note to be read to those of you at Camp Cocker after he was gone. Did we know about this? He could have passed before they left Italy and they have just released the news. I was wondering when this happened too. There is no indication when the letter from Einstein (George) was written. George would have wanted to be with Einstein when he passed away but it could have happened sometime this week while he and Amal have been in Kentucky. So sad. Losing a pet friend is the same as losing a human friend. It hurts. Too bad the twins won't get to know Einstein. I bet they would have been great pals. True Lizzy, he could have been with them or it could have happened before they leftt Laglio. We will only know if and when George says. Gosh, I'm crying as well! What a wonderful letter! Oh Einstein has had the most Wonderful life that a dog could ever have. and his Dad's many friends, I'm sure. Condolences to George, Amal, Millie and Louie. Such sad news. Rest in peace beautiful Einstein. You'll be a great loss to your family who loved you. 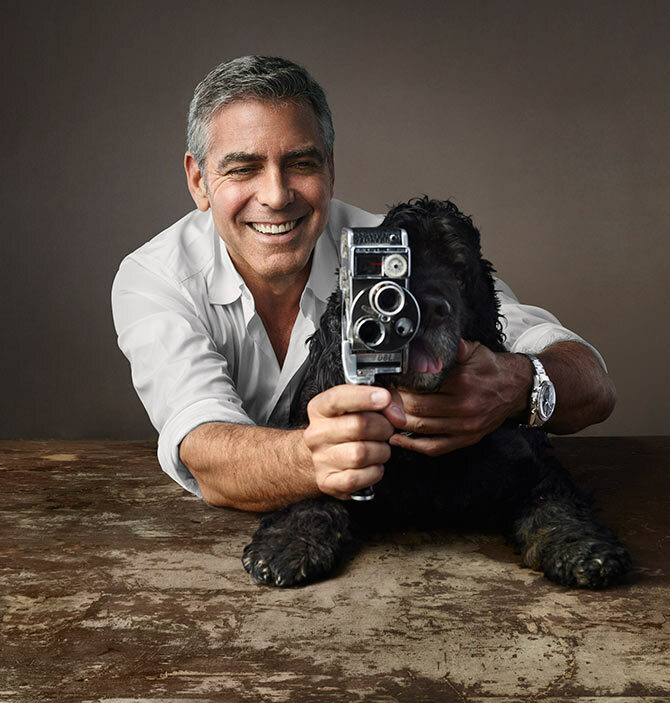 I may be way off base, but wasn't there something about Amal buying George two cocker spaniel puppies as wedding presents or something? Maybe I'm just having a senior moment. Yes there was but I don't think it was true. I think George adopted Louie before they got married. Thanks Annemarie. I wasn't thinking about Louie. I just thought I remembered something about her giving him puppies and I was wondering what happened to them. Maybe you're right, and it wasn't true. PAN - Do you mean they actually saw Einstein and Louie? Could be. If they were far enough away they might have looked like puppies. there were also reports that she bought him glass from Murano (a Venetian island) and some table cloth (or something similar, I don't remember anymore). I never took this as a fact, for me this was a rumor like many others. The dogs we occasionally saw were Einstein, Louie and Millie. Of course they might have a dozen others, but we also don't know if they have horses, birds, lions or snakes as pets.. I'm not a fan of snakes either but there are people who have snakes and other reptiles in a terrarium at their home. 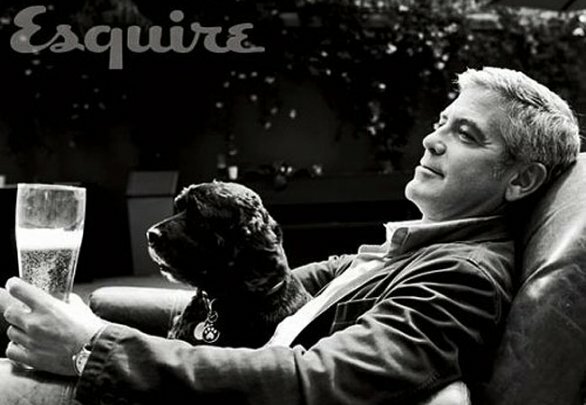 I assume that George and Amal only have their dogs but that's just my suggestion, we simply don't know about that. But I do remember how heartbreaking it was when our beloved dog died after 14 years, nearly 13 of them spent with my family (her previous owner wanted to shoot her because he'd bought her for hunting and she wasn't good at that). It's the loss of a beloved family member. We know George had a pig, Max, for many years until he died. He also had bulldogs? Am I remembering correctly? And, as I recall, one of the bulldogs died from being biten by a snake outside of George's home. Does anyone else remember this? But I don't think George ever mentioned owning snakes or any other exotic animals. I think George needs a little more from a pet than you'd get from a snake. Besides, I'm pretty sure most places aren't as welcoming to reptiles as they are to dogs or cats. When George travels the snake would probably have to stay at home. Not much fun. George Clooney had an emotional roller-coaster of a week ahead of his trip to Toronto for the North American premiere of Suburbicon at TIFF Saturday night. The dark 1950s-set comedy that he co-wrote with the Coen brothers – “the boys” – premiered at the Venice Film Festival on Sept. 2. Pal Matt Damon stars as a scheming executive whose get-rich-quick plans go awry just as the town’s lone black family moves in on their block. Clooney then brought the twins he welcomed with wife Amal in July to meet his parents. He then had to fly to his home in Los Angeles for a heartbreaking goodbye. 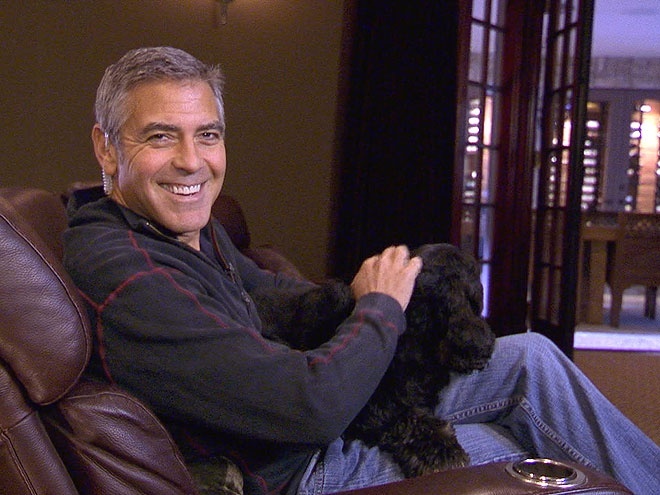 Clooney adopted Einstein in 2010 from the Los Angeles–based Camp Cocker Rescue after seeing a photo of the dog on the Internet. He used meatballs to win over the pup at their first meeting and they starred together in a series of Omega watch ads in 2015. 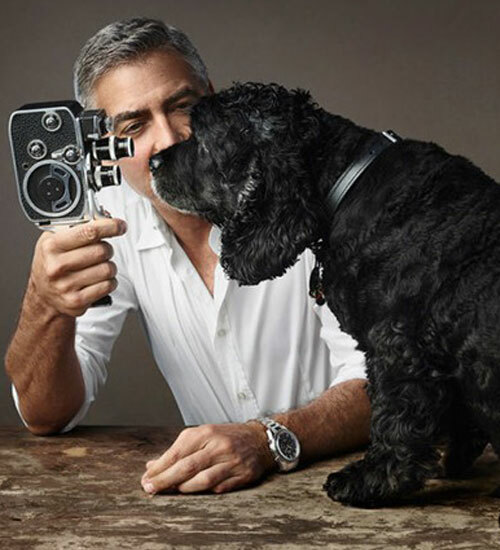 Clooney and his wife are also proud pet parents to several other dogs. Suburbicon has a second screening Sunday at noon. It opens everywhere Oct. 27. Sorry guys if I confused you with talking other pets and used snakes as an example, I certainly didn't want to confuse you! And also had no idea that one of George's previous dogs was killed by a snake. I just wanted to mention that none of us had lived at his houses (at least from what I know) and knows about his pets. IMO it would have been nonsensitive of Amal to present him with two 'designer puppies' although knowing that he prefers to have rescue dogs, and I can't imagine her to be like that. That's all. Carolhathaway - I'm confused now, but not by you. I think the whole snake thing was just all of us going a bit off topic. What's puzzling me now is why did George have to go to LA when Einstein died? He said he had to have him put to sleep, so couldn't he have done that in Kentucky - or did someone else take Einstein to LA from Italy while G&A went to Kentucky? Did the other dogs go too? If they did, does that mean that George is going to spend some time in LA after TIFF? Sorry. Just a bit kerfuffled. LizzyNY wrote: Carolhathaway - I'm confused now, but not by you. I think the whole snake thing was just all of us going a bit off topic. What's puzzling me now is why did George have to go to LA when Einstein died? He said he had to have him put to sleep, so couldn't he have done that in Kentucky - or did someone else take Einstein to LA from Italy while G&A went to Kentucky? Did the other dogs go too? If they did, does that mean that George is going to spend some time in LA after TIFF? Sorry. Just a bit kerfuffled. i think that after Tiff he will be back in kentucky, take amal and the kids and go to LA (on Tuesday he has the telethon) where he will stay for some time. Suburbicon then will be release at the end of october in the US, and in that time he will promote the film. What was quite interesting if one wanted to try and join up the dots is that in the article from Venice at the Suburbicon dinner I think Amal said to somebody that they had to go to LA after that - I wonder if they did things the other way round i e LA for Einstein, who had been in Italy when Galloway of THR was there, and then went to Augusta. I think they took him home because in the end he was in a place he knew. George's probably wanted his vet to put einstein to sleep someone he could trust and Einstein new. Amal saying they had to go to La was probably because they had already made arrangements for Einstein to be put to sleep. and then flew to LA where Amal and the babies are. Well, according to the Vanity Fair interview, he's in Toronto and Amal and the twins are in LA. So I guess they all went to LA together and then he went on to TIFF on his own and will go back to LA when he's done. Whoever handles their travel arrangements has one hell of a job! I think They were in Kentucky together then Amal took the twins, dogs all together to LA while he went to Toronto for the promotion. After that he'll return to LA. We can only go by what the article says George said they flew to Kentucky and then to LA. So afterward he flew to Toronto and will fly back to LA probably tomorrow.